Author: Terence Frederick Mitchell †. Edited by: Harry Stroomer, Stanly Oomen. Series edited by: Harry Stroomer. 14 pp. Roman, 349 pp. This volume contains a survey devoted to the Berber language of the town Zuara on the west coast of Libya. Little was known about this language when Terence Frederic Mitchell (1919–2007) started to study it in the late forties. The data given in this volume concerning language contact and related subject areas are as relevant as when examined by Mitchell and his informant Ramadan Azzabi in the fifties. 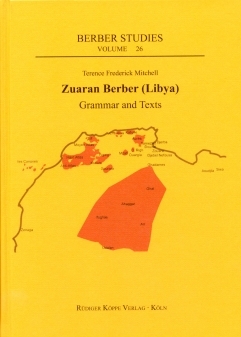 At that time, Mitchell published two articles on the Zuaran Berber noun. The present book mainly presents his research on the verbal system. This is especially characterised by the use of several affixes, the existence of the aorist as grammatical aspect, and derivations, which are likewise being developed by affixes. In detail, the volume alludes to the diversified typology of conjugation, tense and personal affixes, the derivation and the negation of the verb, the incorporation of object pronouns into the verb, and verbal nouns. The volume is completed by six short conversational texts reflecting the Zuaran everyday life, annotated and translated into English. (For further reading and analyses of Zuaran folk tales see also Mitchell’s text edition Ferhat. An Everyday Story of Berber Folk in and around Zuara (Libya), (see link below). What makes this book particularly interesting is the fact that Mitchell, a well-known Arabist, paid close attention to contact phenomena between spoken Libyan Arabic and Zuaran Berber. Collecting data for Zuaran Berber, he accumulated evidence for mutual influence of the two interacting languages. In order to make the text more legible the phonetic transcriptions are adjusted to modern standards. This book is an important contribution to the study of Berber languages, describing a too often neglected variety. Its subject is particularly timely now, at a moment when Berbers in Libya are conspiciously reasserting their identity and their language’s right to a public role. Most studies of Berber continue to be written in French; this book is one of the relatively few windows onto Berber linguistics directly available to English speakers [...] For anyone interested in Libyan Berber, it is indispensable. It [this book] is remarkable as one of the few publications – and a fairly readable one – concerning the Nafusi group of northeastern Berber, especially when it comes to sources written in European languages other than Italian [...] The book under review is striking for its clear phonological representation of data (with complete vocalisation and stress marked), many naturalistic examples, and continuous comparison with Arabic contact varieties (such as the resemblant functions of passive forms, : 66). Mitchell’s remarks on pragmatic usage [...], frequency (such as of morphological patterns), and the need for converational analysis [...] fit in with contemporary discussions.